Shakshuka is named as a staple dish in Tunisia, Libya, Algeria, Morocco and Egypt, and Wiki says it is popular in Israel. The origins, according to Wiki, were in the Ottoman Empire from where its fame spread to Spain and the Middle East. The origins are also said to be in Yemen. In each country or region there is a variation in the ingredients and the sides along with it is served. 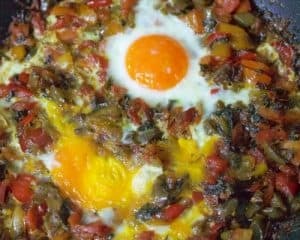 A traditional version iswith crushed tomatoes, hot peppers, garlic, salt, paprika, olive oil and poached eggs. As Poached eggs are an essential ingredient, it is often served for breakfast, though it may serve as the central dish for dinner too. Ottolenghi says that Shakshuka is a North African dish with many variations, sometimes with preserved lemons, sometimes with the addition of feta, different herbs and spices. It is ideally cooked and served straight in the pan in which it is made, along with chunks of white bread. My version is served with lightly toasted bread and a simple lettuce salad with a citrusy dressing. 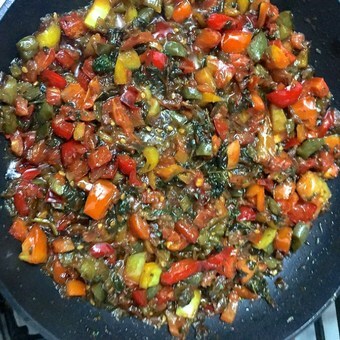 I made the sauce earlier in the day, and just before dinner, broke the eggs into individual platters of the sauce and poached the eggs in the pan on the stove, as Ottolenghi’s recipe requires, so that the yolk just sets and shimmers below the surface, and the peppers and tomatoes stay juicy. Shakshuka, a Tunisian dish of Poached eggs cooked in a base of sweet bell peppers, tomato, saffron, parsley, thyme and onion. The herbs are an integral part of the dish and not just a garnish. Serve with a green salad in a lemon dressing. Select large red juicy tomatoes, dice them and set aside till required. Dry roast the cumin seeds in a large pan for 2 minutes, keeping the stove on high and stirring continuously so that the cumin does not char. 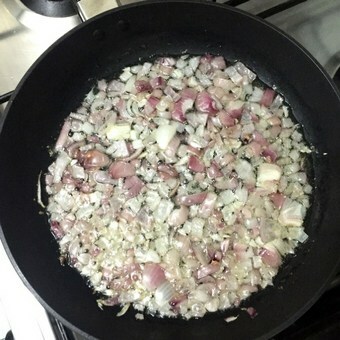 Add oil and then the onions. Sauté for about 5 minutes, stirring frequently. 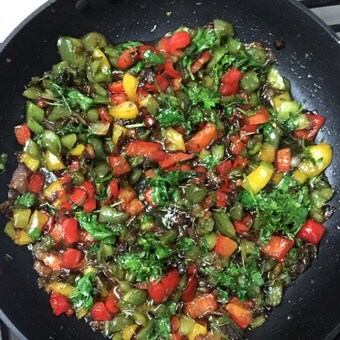 Add the sugar, stir, then add the chopped peppers, parsley, bay leaf and thyme. Add the chopped cilantro after reserving 1 tablespoon for the garnish. Cook on a high heat for 7-10 minutes, again stirring frequently. Add the chopped tomatoes, saffron, paprika, a little salt and pepper. Stir well. Cook on low heat for about 15 minutes, frequently adding spoonfuls of water and stirring, so that the sauce gets the consistency of a pasta sauce, without getting dry and stringy. I have listed one cup of water, in the ingredients, but use only as much as is needed to get the required saucy consistency. Ottonlenghi advises that at this stage, the sauce be tasted for seasoning and adjusted so that it is potent and flavoursome. Remove the bay leaf and discard. Divide the sauce into 2 deep pans, each for an individual portion. Warm the pans with the sauce, on the stove. Make two gaps in each pan and gently break an egg into each gap. Sprinkle lightly with salt, cover the pans with a lid apiece. Cook on low heat, gently, for 10-12 minutes or until the eggs are just set. Garnish with cilantro and serve hot with bread and a simple salad of greens, with a dressing of lemon juice, olive oil, salt and pepper and one garlic clove. 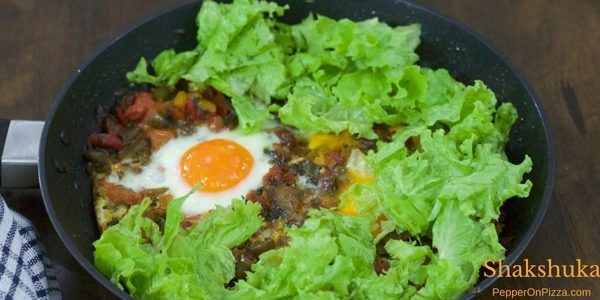 This sounds fabulous – definitely making Shakshuka really soon at home!